For small businesses owners to growing accounting firms, digital channels are one of the most effective and affordable ways to grow your business in today’s digital world. As global leader in cloud accounting, Intuit is aware of the power of online solutions to drive your prosperity and is committed to supporting your to growth. Yet, from regular conversations with its customers, Intuit knows that many small businesses struggle with utilising online channels. It might be a challenge for you to find the time to market yourself to prospective customers or how to adapt and grow your business in the often confusing social web. Attracting more leads and sales. Keeping the sales funnel full. As an entrepreneur this can all be overwhelming. As small business owners you are often working in your business and not on your business. You may also have not kept up with the latest digital marketing strategies. The entrepreneur is living on hope marketing. Hoping that a new customer will ring or email them tomorrow. To help you navigate the social web, we have teamed up with global digital thought leader Jeff Bullas to show you three simple steps to your online success. 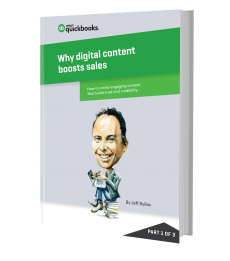 Jeff is an entrepreneur, blogger, author, marketer and keynote speaker and specialises in working with businesses to optimise their digital brand through digital content creation. In this series, we will show you how to attract business and grow sales with digital tactics, tools and technology that can provide a predictable stream of business prospects, converting to sales. We will cover each topic in a 40 minute webinar and all attendees recieve a complimentary e-book. Content marketing is the new standard for connecting with your audience, getting them hooked on your products and services, and converting them into loyal customers. What is content marketing, what are its challenges, and how it can help you? These are some of the questions you need to ask yourself before you embark on this journey. Download the e-book for the answers. In this e-book you will learn the four key tactics – organic social media, email marketing, search engine optimisation (SEO), and collaboration – that can help you drive organic traffic to your website free. We’ll also look at some of the most effective paid options, such as Google AdWords, social media advertising, and influencer marketing. Download the e-book to jumpstart your efforts and give your web traffic a boost. Great design and sleek navigation are not enough to convince people to give your business a try, Intuit and global digital thought leader Jeff Bullas have teamed up to show you simple steps to your online success. You need to provide your prospects with more than just a fancy looking website if you want them to convert into customers and become loyal advocates for your brand. This e-book is the 3rd part of an e-book series on digital marketing, that will bring together the learnings about the power of digital content in driving sales (e-book 1) and the art of attracting visitors to your website (e-book 2), to help you convert your website visitors and content into actual business results. You will uncover the secrets of copywriting, art, technology, and business automation, so that you can use digital marketing as a means for generating leads, sales and loyalty for your business.